With 656,004 page views to date, my 101 Things to Do With Your Toddler post has been one of my most popular. I've made it my goal to do everything on the list with my daughters this year. Little by little, we've been checking them off. Some of them have been a big hit, and we've done them many times already. If you'd like to try to do all of these activities with your toddler or preschooler, I've made a free printable checklist to make it easier. Click the link or the chalkboard image below to open and print the printer-friendly checklist. 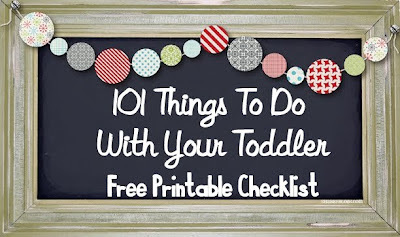 101 Things to do With Your Toddler Free Printable Checklist! I tried to find your email to contact you... can i share this on my blog with a link to you?